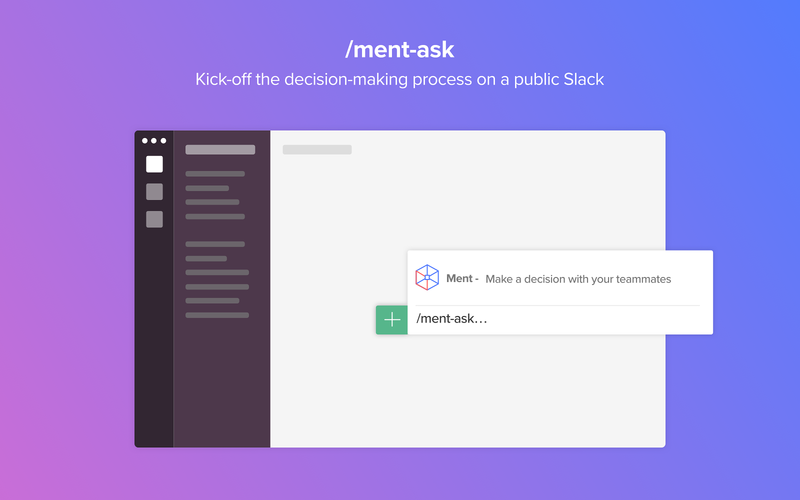 The MENT app is a decision-making platform integrated to Slack which allows you to conduct AI moderated discussions directly on your Slack channels. What can you do with MENT for Slack?•Start a new discussion - Use /ment-ask to open a new discussion in your public channels. Example: How can we increase retention?•Conduct a moderated discussion - Engage with your colleagues, add answers, vote and agree or disagree. 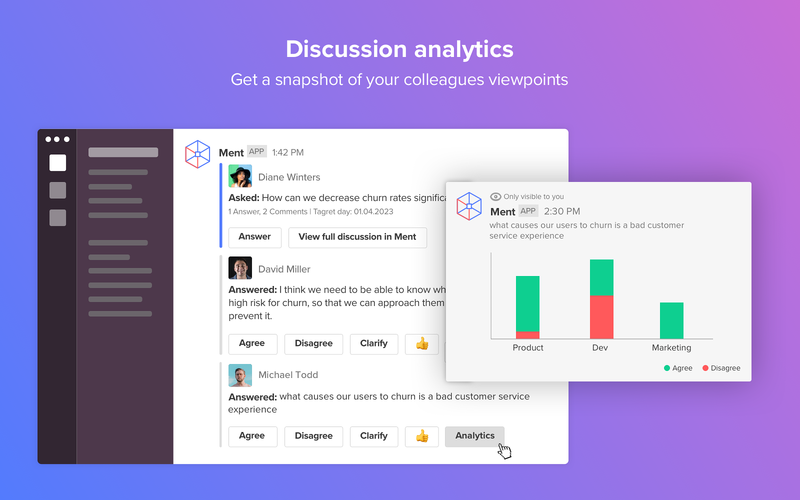 •View discussion analytics - Get a snapshot of your colleagues viewpoints.•Monitor & discover - use /ment-discussions from any channel to populate all live discussions in the #Ment channel.•*Make a decision - go to ment at any time for the full picture. View the top answers and check out analytics. 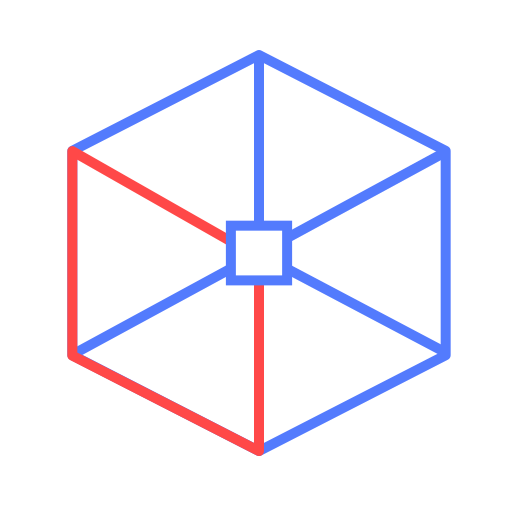 Now you are ready to make the best decision, ever!•Need help? 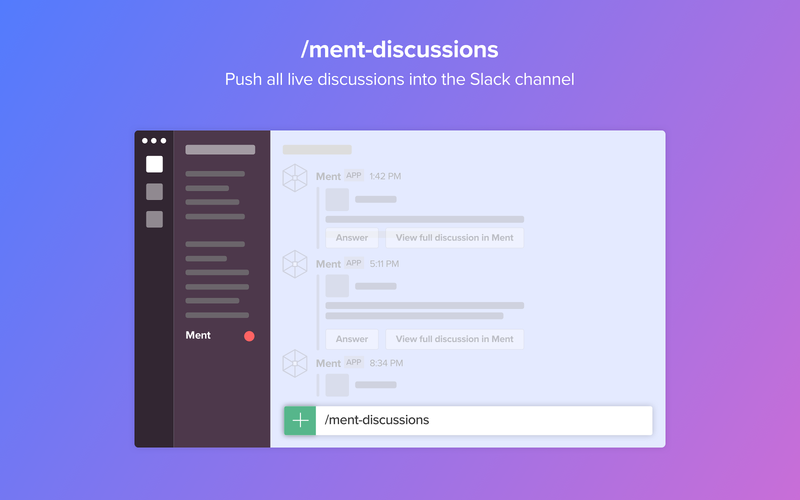 - use /ment-help to get guidance whenever you need it.•Notifications - Get notifications for new questions, answers, comments and @mentions right on your #Ment channelNew to MENT? ment will be able to send messages to your workspace. ment will be able to access your profile fields, as well as any data you’ve entered in them. ment will be able to view the email addresses of your Slack workspace’s members. ment will be able to access basic information about your public channels (including names, topics, purposes, creation date, and latest message). ment will be able to modify information about your public channels, including name and purpose, as well as archive and create new ones. ment will be able to view your Slack avatar on your workspace. ment will be able to view your user id number, full name, and workspace id number on your workspace. ment will be able to view your email address on your workspace. ment will be able to view your Slack workspace name, domain, and icon. ment will be able to install a bot user that appears in and has access to your workspace’s directory. It can also post messages and view activity on messages in any channel it is invited to. ment will be able to access profile information for all users on your workspace, including names and contact information. ment will be able to access any messages and activity you can see in public channels.